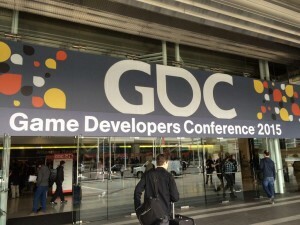 I can say I have been at least once to GDC, San Francisco, the main videogames industry event in North America. 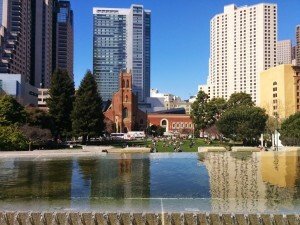 GDC attracts over 24,000 attendees and is a central gathering place for programmers, artists, producers, game designers, and business people involved in the development of this growing and fascinating medium. Offering a choice of over 400 lectures, panels, tutorials and round-table discussions, GDC is a fantastic opportunity for learning and sharing. In addition, it hosts the Independent Games Festival and Industry Choice Awards, which are fantastic shows to attend, as well as awesome opportunities to learn about the best games of the year. I knew all these before I decided to attend it this year but what I did not know was that with my Summits, Tutorials & Bootcamps pass, I’d be able to listen to and sit at the same table with experienced game designers during the Game Design Workshop. 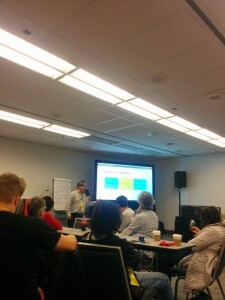 This intensive two-day workshop, as the speakers, among whom, Marc LeBlanc, Senior Software Engineer (in the picture above) and Stone Librande, Lead Designer at Riot Games, put it, ” explored the day-to-day craft of game design through hands-on activities, group discussion, analysis and critique”. Participants immersed themselves in the iterative process of refining a game design via numerous exercises and group work. 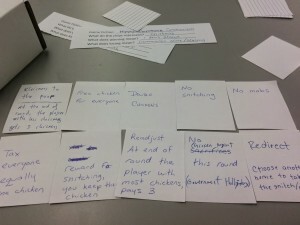 This are some pictures outlining the card game I helped my group make on Day 1, which re-skinned the game Sissyfight. In our team we chose communism as the central theme of the game. 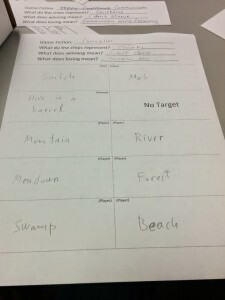 The exercise consisted in recording our observations about how the gameplay changed as we gave the game a different metaphor and meanings associated with each action. 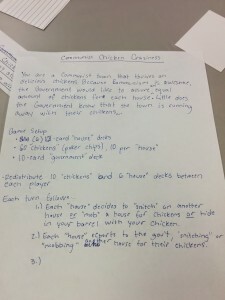 This was just one example of the simple and fun way to learn about game mechanics. 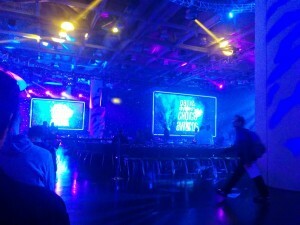 #1ReasonToBe was at this year’s GDC one of the most inspiring panels that I have attended. 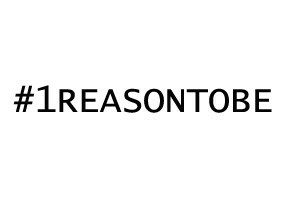 Eight women delivered powerful messages about the #1ReasonToBe in the videogames industry to a full room and often followed by standing ovations. This is particularly important as 2014 was also (sadly!) the year of #GamerGate. 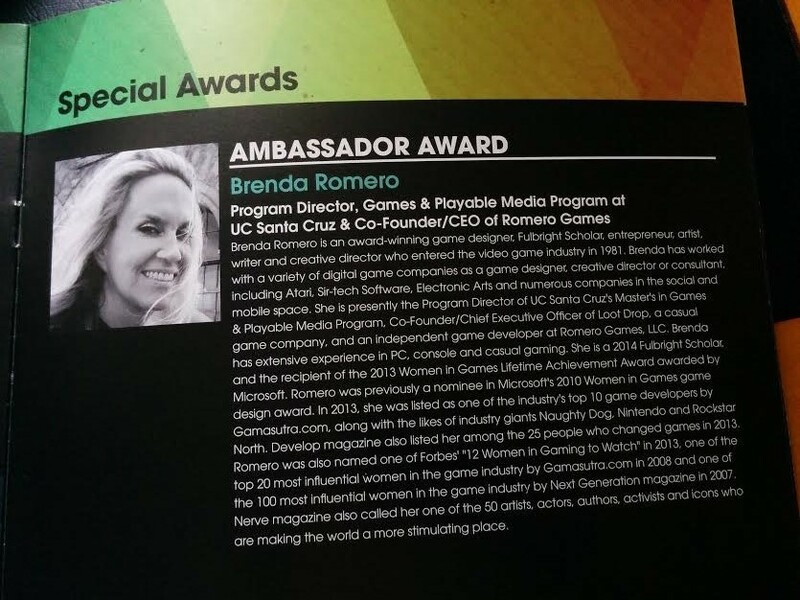 After lining up for over an hour to enter the room, I had the opportunity to listen to legendary game developer Brenda Romero (former Brenda Brathwaite) whose work has been honored this year with the Ambassador Award. Amy Hennig , Sr. Creative Director, Electronic Arts / Visceral Games. In addition to #1ReasonToBe, another panel that I have attended covered the issue of online harassment. Particularly, listening to panelists who had to deal with online harassment, specifically as a result of #GamerGate, such as Zoe Quinn was an unique opportunity to hear her own reflection and perspective on the response the industry must have to such practices. The speakers discussed in a practical way, “what steps to take, how to mitigate damage, and survive – logistically and emotionally” should something like this happen to anyone in the industry (GDC, 2015, Panel “Game Developer Harassment: How To Get Through”). 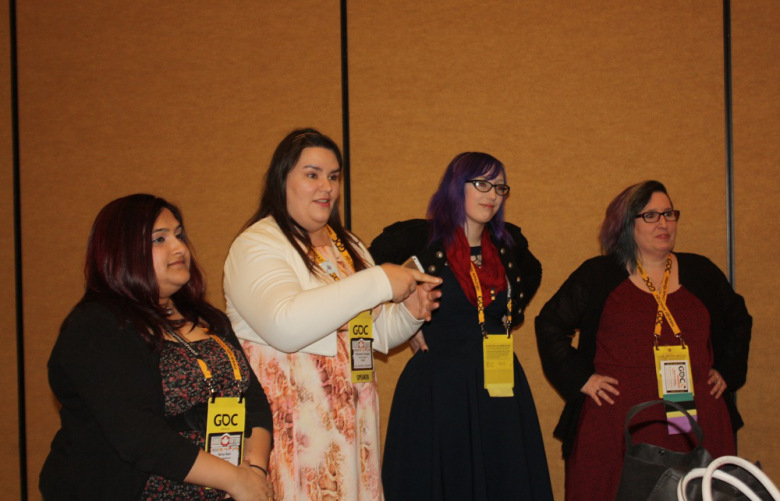 Zoe Quinn, Elizabeth Sampat, Neha Nair and Donna “Danicia” Prior told the large audience about what they learned from their online interactions and emphasized how no one should have to go through doxxing or swatting or any kind of online harassment alone. 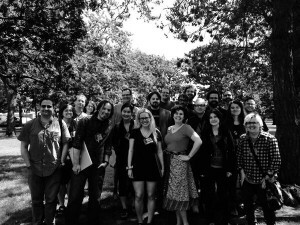 This panel also had an impressive attendance, including the one hour line-up to enter the room. I was impressed to see how the attendees responded to these talks and hope the industry is better equipped now to deal with online harassment. 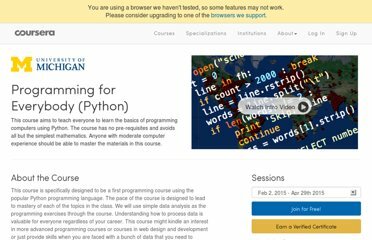 The course “Games for Digital Humanists” I took in the summer of 2014 at University of Victoria, as part of the Digital Humanities Summer Institute and taught by Andy Keenan and Matt Bouchard was one of the most rewarding professional development activities I have ever participated in. 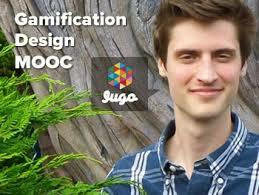 The course was structured around theoretical approaches to review game design and next, it offered concrete principles for iterative game design processes. The course balance, class structure and readings have been a source of inspiration in my ESL work this year. I feel I have also made important professional relationships that will be beneficial for me and the college as I complete this work. 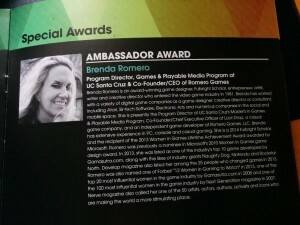 In addition, the possibility to brainstorm with others about game design is something I learnt to value after this experience. Here is a list of courses offered at DHSI. During days 3 and 4, students completed a game design concept teams. They presented it for review and analysis to the class on day 5. In this picture you can see the concept layout for the card game, Freaky Puppet Show, that a team consisting of myself and two other colleagues proposed.